A direct hint: this question. You are Dr. Nathaniel - a renowned archaeologist, and involved in a research about an ancient site. But, there is only one problem - the place you are visiting to study about is cursed. "What!?" You see Mike's stone statue. "No wait. It is too life like to be a statue." And you realise that it is indeed Mike who has been turned into stone. You panic, and see a parchment with some numbers written on it. You can make out that it is surely Mike's handwriting, but the paper is somehow too damaged to understand what is written. You move towards the statue, slowly, with chills running down your spine. Near the statue, on the entrance, there are four wheel type things engraved (Maybe, you aren't sure if they are engraved), and some blocks, 80 to be precise kept in a cavity in the wall. Each block contains a number, which can be 0, 1, 2, 3, and 4, with 16 blocks of each number. You hear some sound. Looking in its direction, you see a sandstorm, but it is just far enough that you can note down what is written on the wheels, and run back to your camp (because you think the camp would be a safer place for some reason). You quickly take out your note pad, jot down the written characters, and run for your safety, just reaching the camp before the sandstorm comes knocking at your door. The last wheel was empty but had some slots- 16 in number. The numbers in the other three wheels seem to be like the blocks permanently fitted in identical slots. You conclude that you need to figure out the pattern for the last wheel using the given three wheels. The blocks must be required to be fitted in the slots, with only one block per slot. You need to hurry as the curse can be broken only within nine days. You don't know when Mike was turned into stone, but if it was on his first day here, then you have to be really fast. How should the fourth wheel be filled with the blocks? 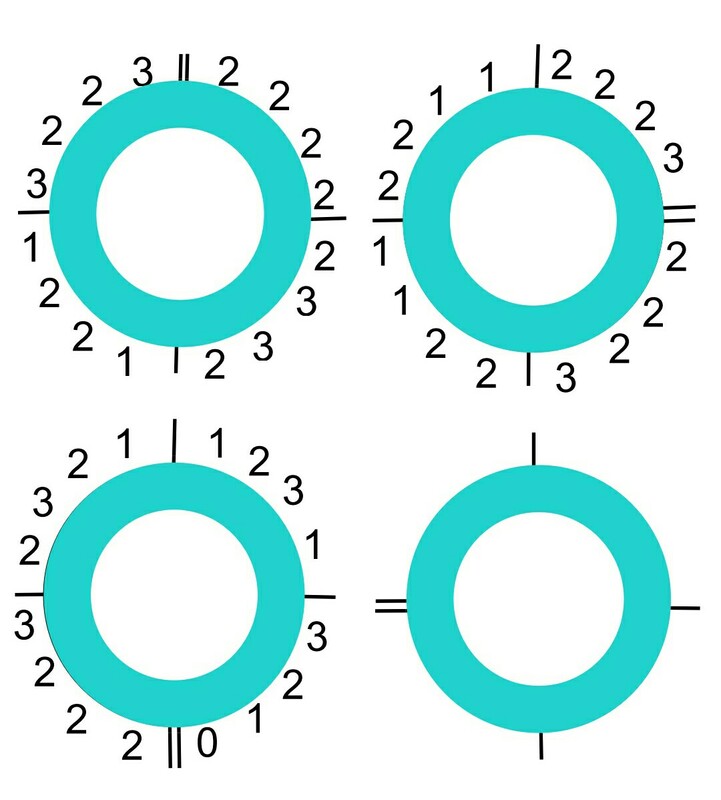 The pattern lies among the complete wheels, not the corresponding numbers. The numbers lead to letters. comes from the bitwise OR of the corresponding binary values. and there is still no number 4 on any wheel. Not the answer you're looking for? Browse other questions tagged cipher pattern lateral-thinking grid-deduction or ask your own question. How do you escape the prison?